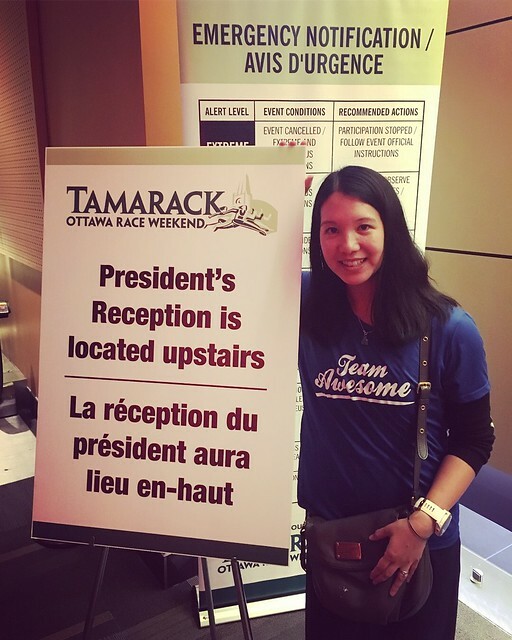 What can I say about Tamarack Ottawa Race Weekend (TORW)? Wow. I am completely blown away by how wonderful it was. 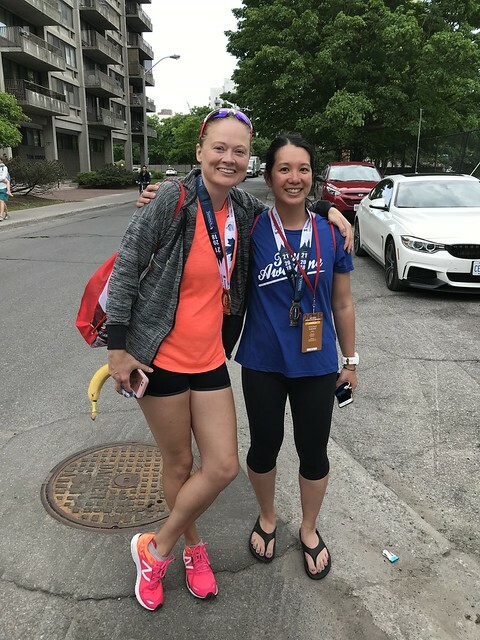 If you read my recap on the Ottawa Marathon in 2016 (aka, the hardest race I’ve ever run in my entire life), you may be wondering what made me come back. 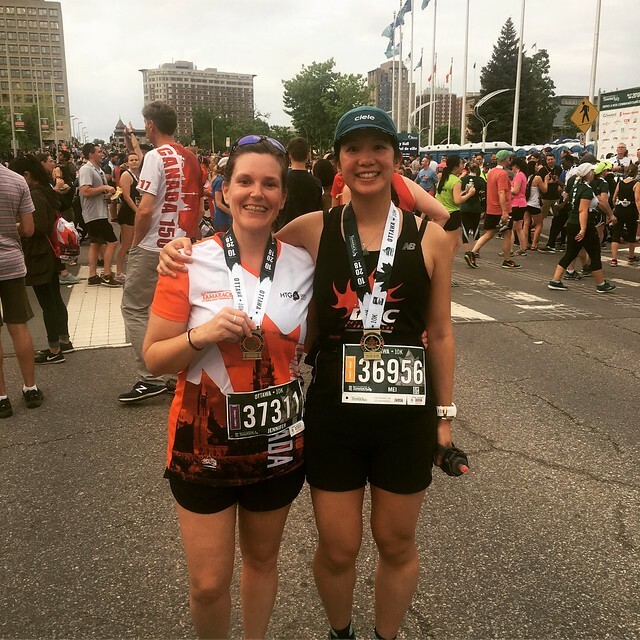 Why would I come back to the race that challenged me? 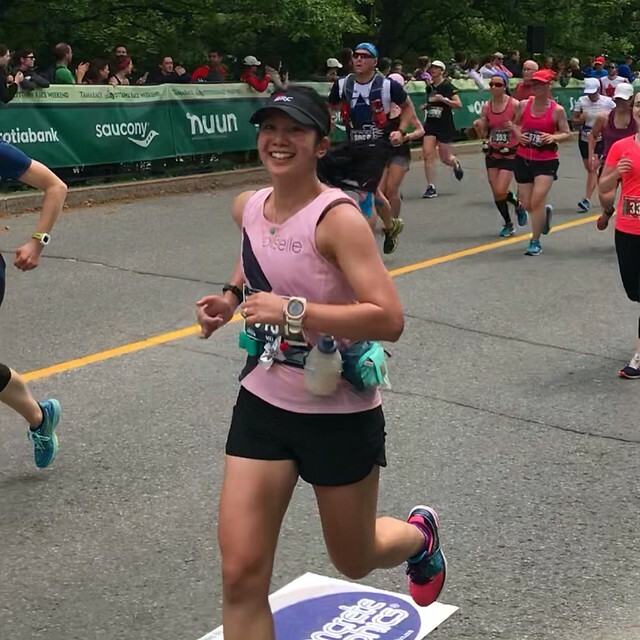 The race that, as I’ve said to my friends, “destroyed me”? I’ve been thinking of returning to TORW for a while now. The organizers, volunteers and crowd support are amazing. 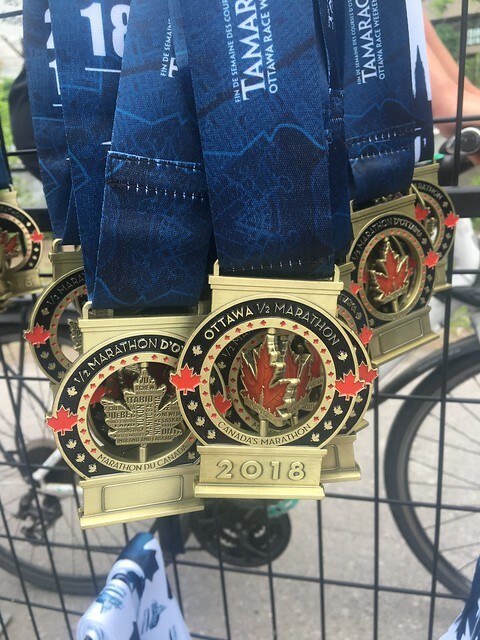 The course is beautiful and I love my Ottawa marathon medal. 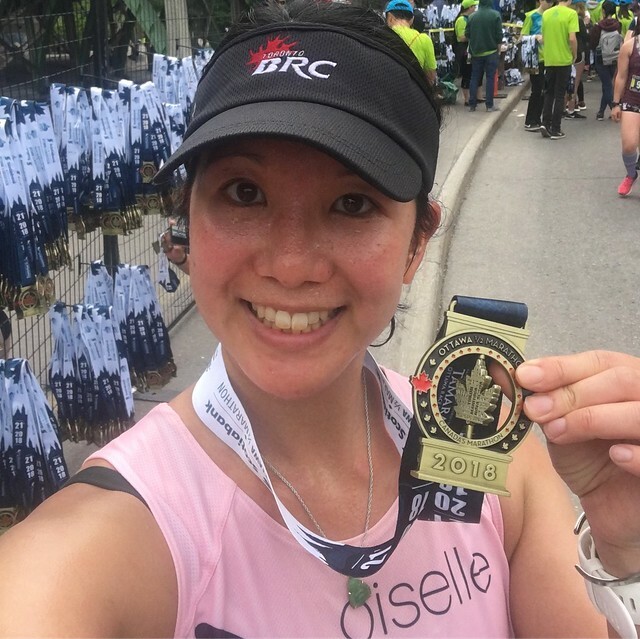 Overall, despite the heat, I loved the atmosphere of the race. 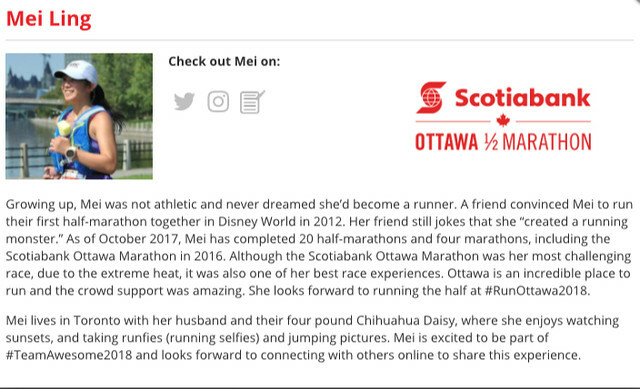 As I’ve been reflecting on my challenging 2016 marathon, I’ve been feeling grateful that, if I was going to experience the hardest marathon of my life, that it was in Ottawa. I couldn’t imagine going through that in any other race or on any other course. 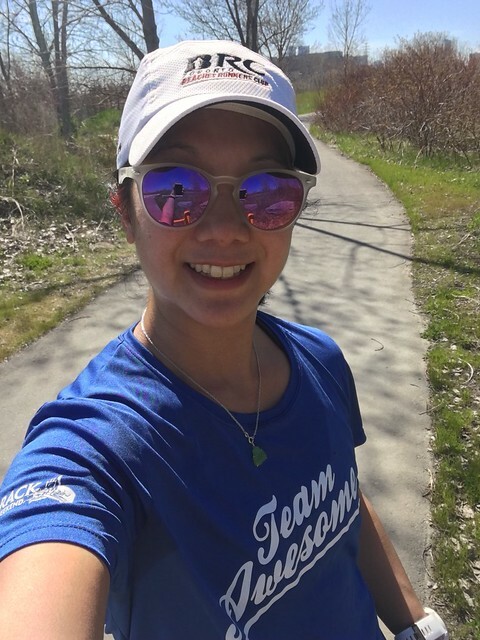 I’m incredibly grateful that I was selected to be a part of 2018’s Team Awesome (TORW’s race ambassador team). It was such a privilege to represent and help spread the word about such a world class race. 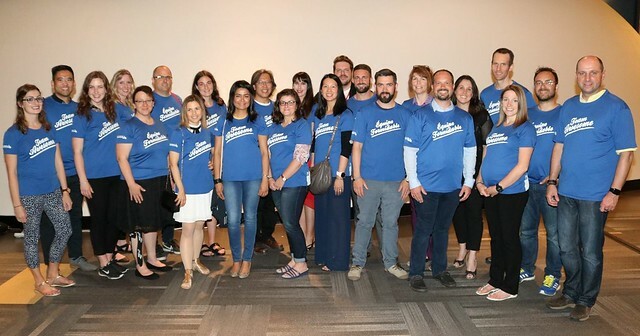 In addition, I loved connecting with others (including my fellow team members) about our training online. 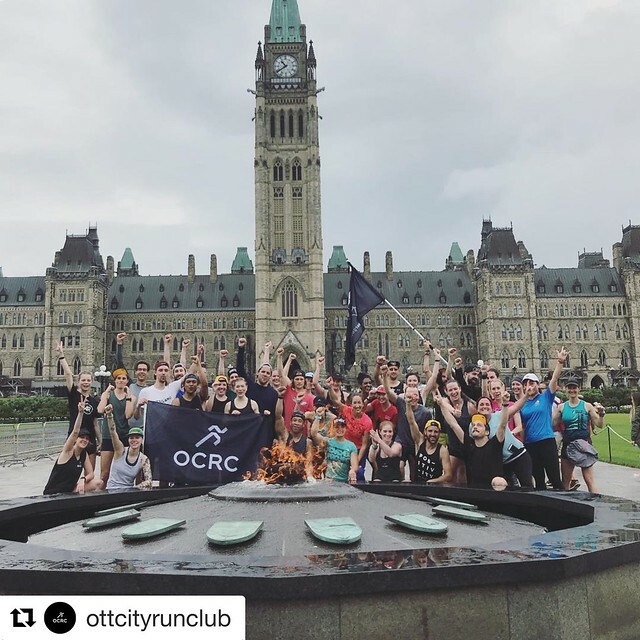 Even though I don’t live in Ottawa, it was a fun way to feel connected to their incredible running community. 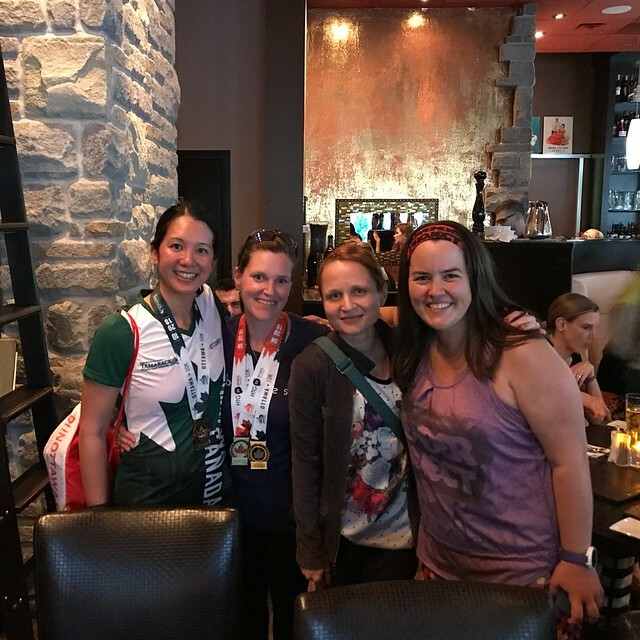 Also, the organizers (along with two other members of Team Awesome who were our go-to people, Leanne and Roch) took really good care of us. 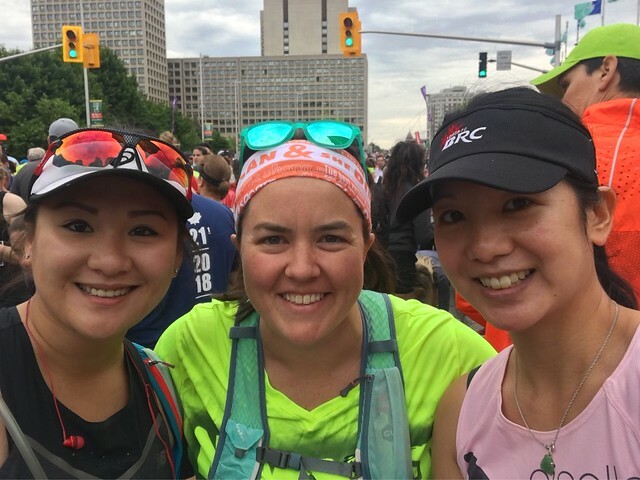 Zizu Optics, a sponsor of the race, very kindly gave us each a pair of their sunglasses (I love mine and wear them all the time) and Xact Nutrition, another sponsor, generously gave us each a nutrition pack. I love their bars so I was also very excited about this. I can’t wait to try their new beet bar. I love my Zizu Optics sunglasses. They’re also Canadian! I honestly couldn’t thank the organizers, Team Awesome co-ordinators or the sponsors enough for the entire experience. 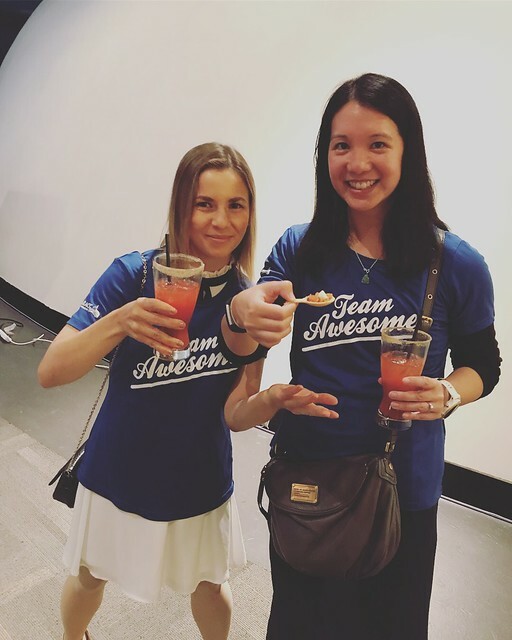 I love Team Awesome. Despite taking a half day off work on Friday I still found myself running behind schedule. Everything just seemed to take longer than what we had planned. 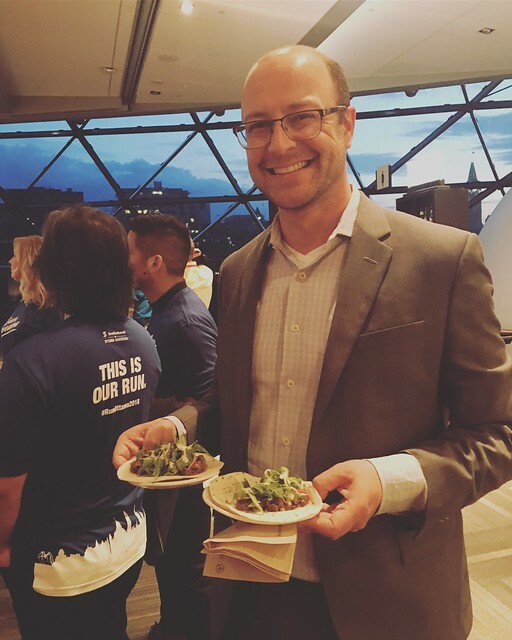 Dan and I ended up arriving in Ottawa a little after 8 p.m. After checking in and quickly changing, we made our way over to the Shaw Centre for the President’s Reception. 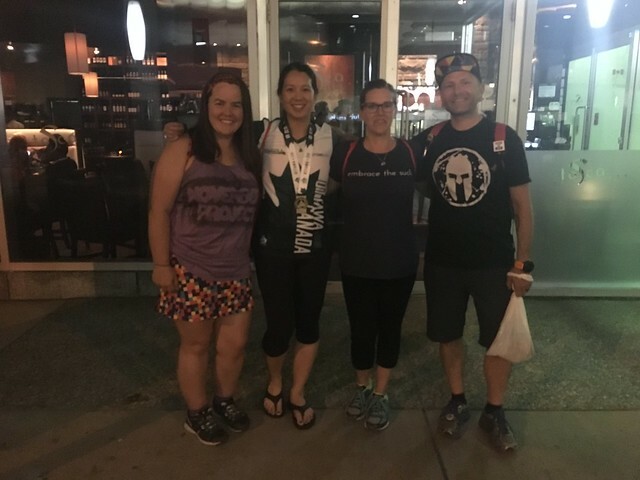 I was really excited to meet other members of Team Awesome in person and was worried that we would miss everyone since we were arriving later. It turned out there was nothing to worry about. When we got to the reception, I made my way to the right side of the room, the way Leanne had directed us to. 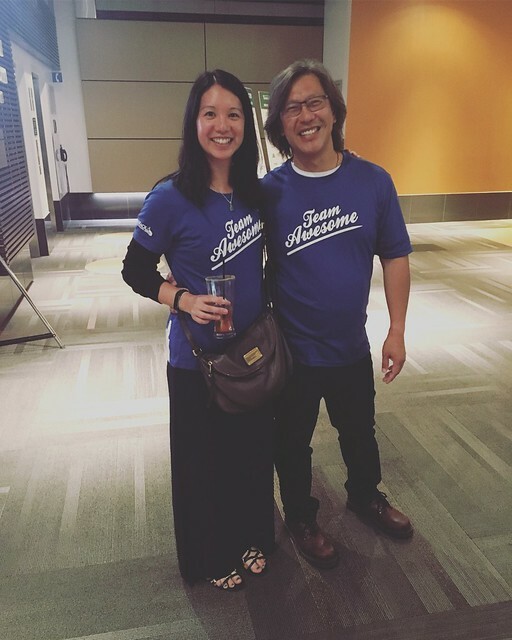 I immediately spotted Team Awesome wearing our team shirts and posing for a picture. I quickly made my way over, pulled my shirt out of my purse and put it on and jumped into the picture. Members of Team Awesome at the President’s Reception. 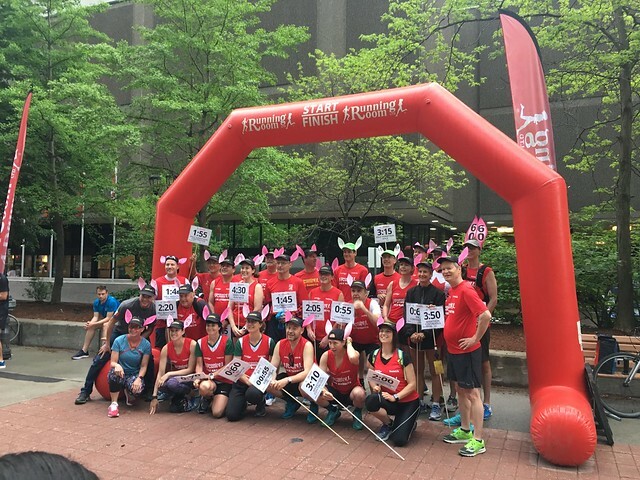 Photo by Ian Hunter from the Slater St. Running Room in Ottawa. 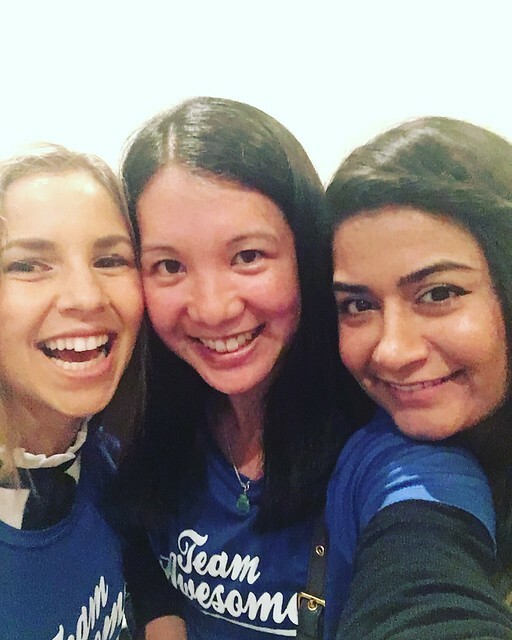 I have to say that meeting Team Awesome in person was a little overwhelming. First of all, everybody looked familiar but since they weren’t in running gear (aside from the Team Awesome shirt) I was having trouble recognizing people. They were all really nice though and it was just exciting to stand there among them. I was able to catch up with Hufsa, Angela and finally meet Dan (who is friends with Rebecca) in person. We took some selfies and even some jump shots. 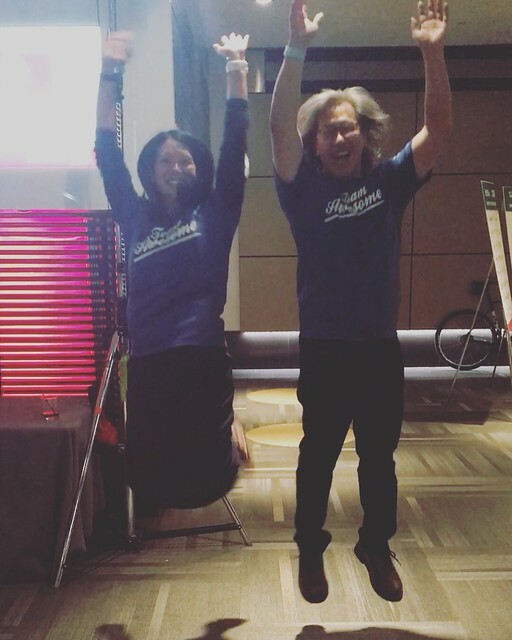 I was impressed by Angela and Dan’s jump picture skills. They got it on the first try! Team Awesome definitely lived up to their name. Selfie with Angela and Hufsa! Dan and I enjoyed a lazy Saturday morning. 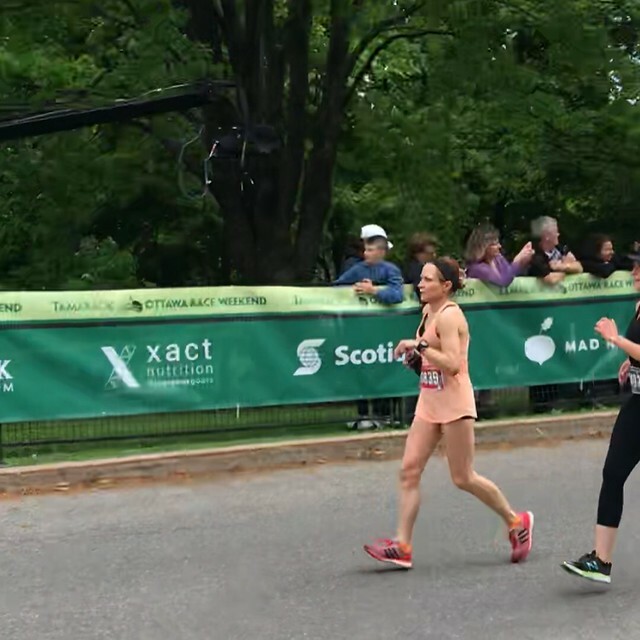 It was nice to be able to sleep in a little before grabbing some food from Starbucks and then running 1km to the start of the 3k Running Room Friendship Run. 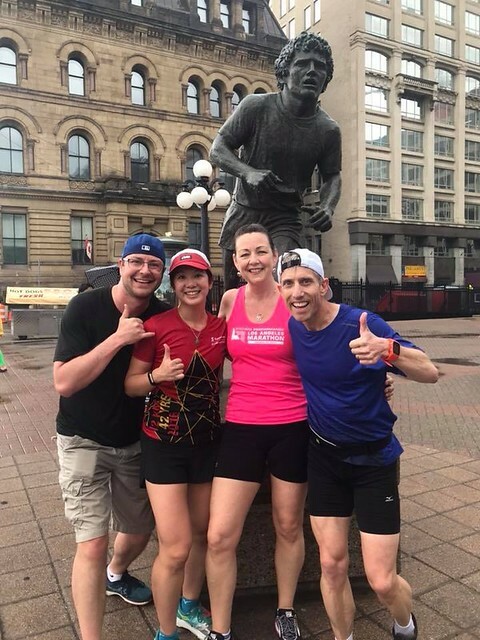 We met up with JP and Mary-Anne at the run and also said hi to Alan (honestly, Alan is always everywhere and knows everyone in the running scene :). 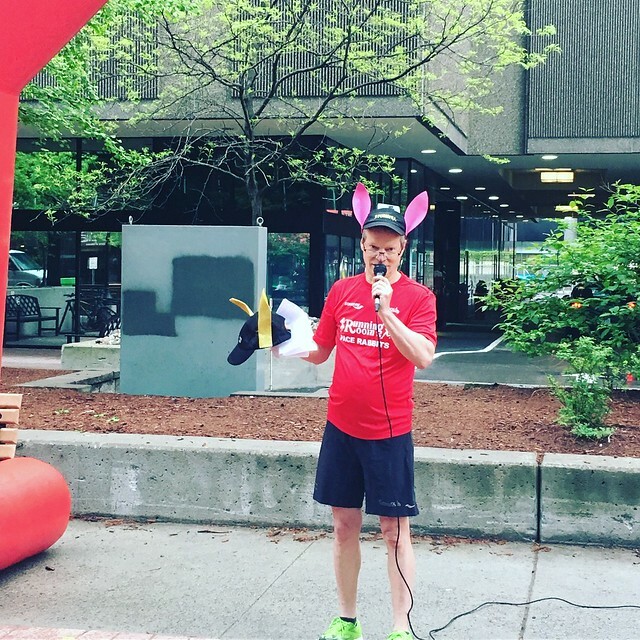 Organizers said a few words before the run and one of the pace bunnies introduced all of the pace bunnies for the 10k, half marathon and marathon distances. There were a lot of bunnies! 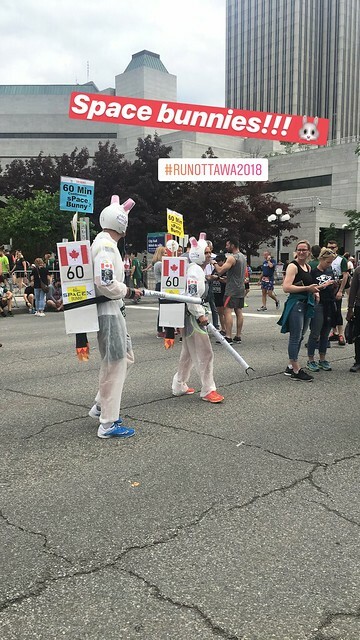 One cool thing that I learned is that every year they award the pace bunny who ran the closest to their time with a pair of golden bunny ears and a bag of carrots. Isn’t that cool? 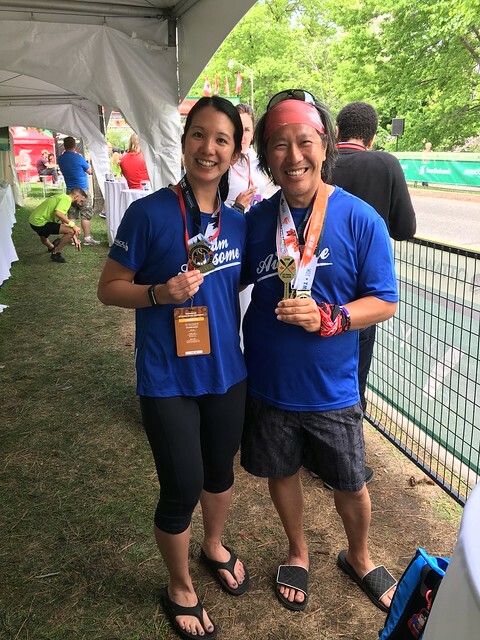 So if you’re ever running a race at TORW and your pace bunny has the coveted golden ears, you’ll know you have an exceptionally good bunny! 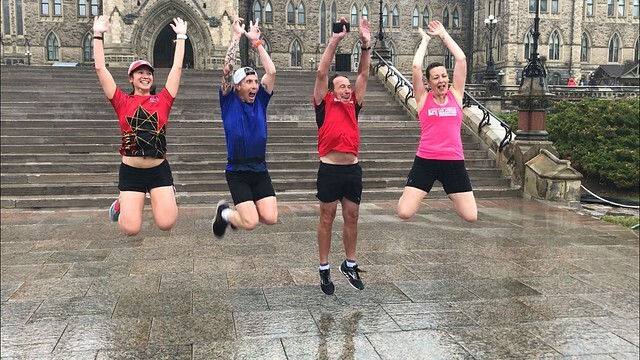 We ran the 3k Running Room Friendship Run at a leisurely pace and stopped to take a picture on Parliament Hill. It rained a little bit but actually felt refreshing. 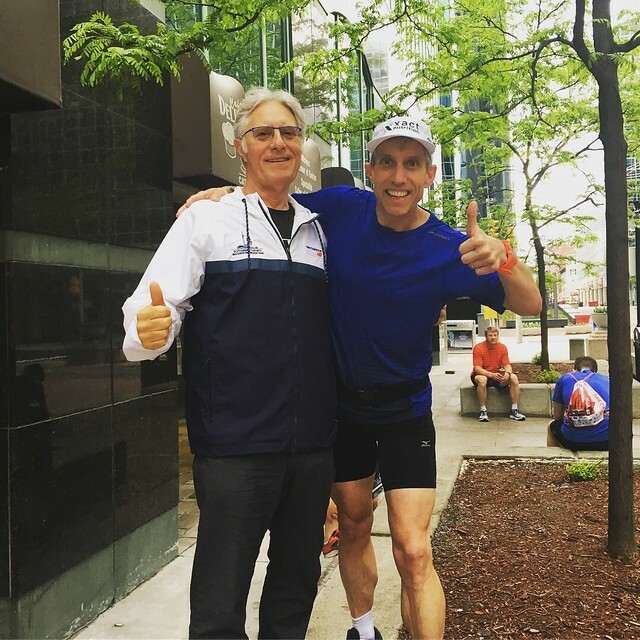 JP talked to John Stanton (the founder of the Running Room) and before we knew it, we were doing a jump shot with him! We also stopped and took a picture in front of the Terry Fox statue before saying goodbye to JP and Mary-Anne. 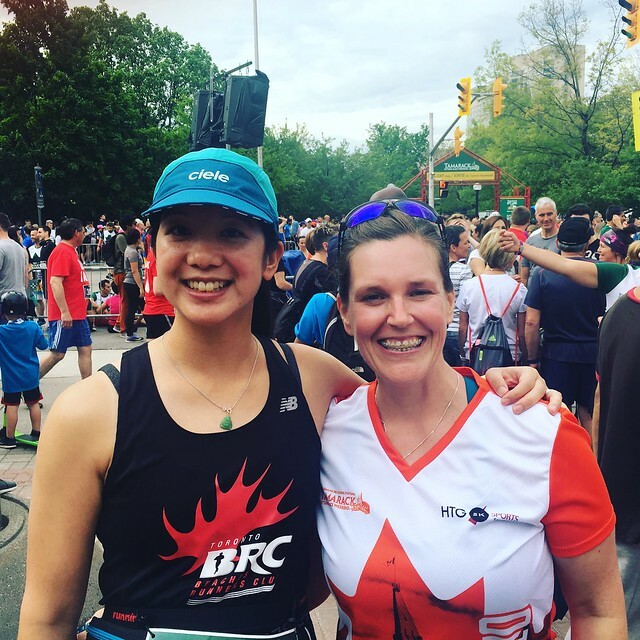 I checked my watch and realized that I could also make it to the Ottawa City Run Club (OCRC)’s 5k shakeout run that was being put on in partnership with Xact Nutrition and Lululemon. 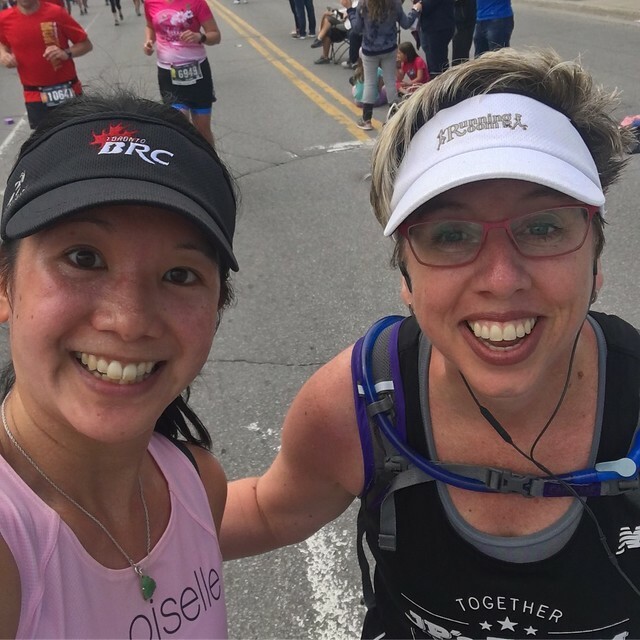 I headed over and ended up running some of it with a woman named Eve who was getting ready to run her first half marathon the next day! I always get really excited when I hear about people running their first of any distance. We were near the back of the group and lost sight of them, so had to wait at a light for the people behind us to tell us where to go. It was a nice break though and at this point the rain had stopped and the air was heavy with humidity. 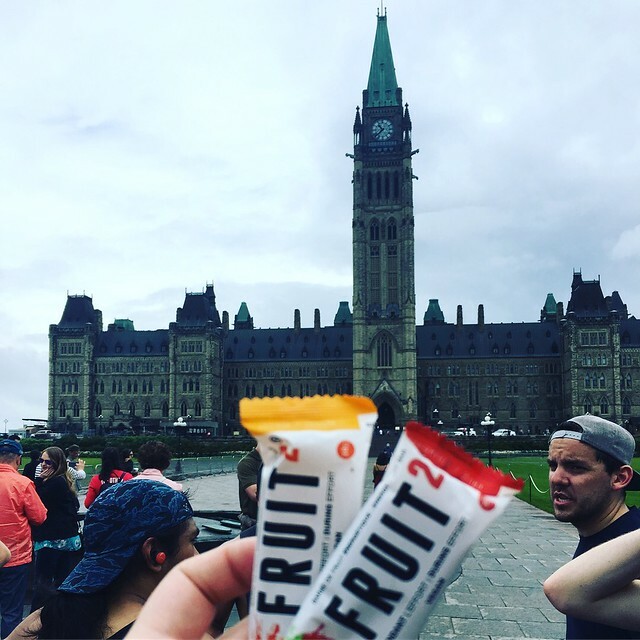 We arrived back at the Centennial Flame where we were given free Xact Nutrition samples. Yum! We took a group picture and then gathered in a circle, arms around each other for a race visualization exercise. It was really well done and got me pumped for the race. 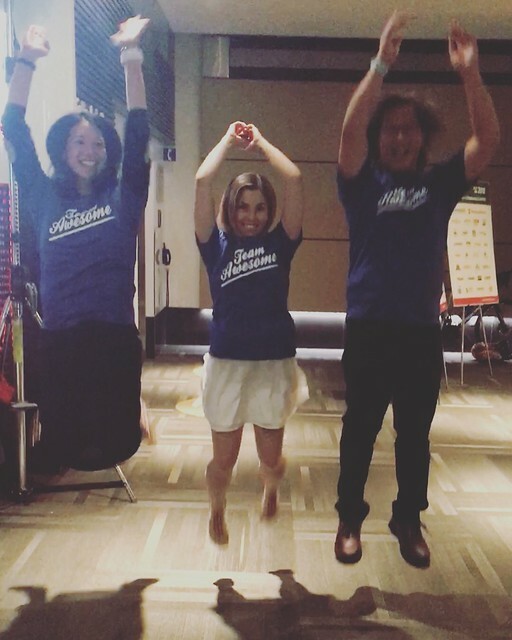 OCRC also talked about their cheer station on course and how there would be confetti canons. I liked the sound of that! Overall, I ran 9k that morning. It was a good start to the day! Dan and I grabbed a quick lunch and then headed over to the Shaw Centre for the expo where our timing was perfect and we ended up meeting up with Jennifer and Mark. 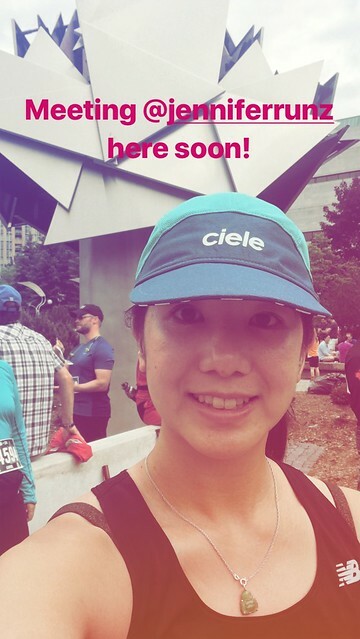 We picked up our race kits, activated our bibs (always exciting for me to see my name across the screen) and then did some shopping. I stocked up on Nuun and got a free waterbottle before heading to the Oofohs booth. 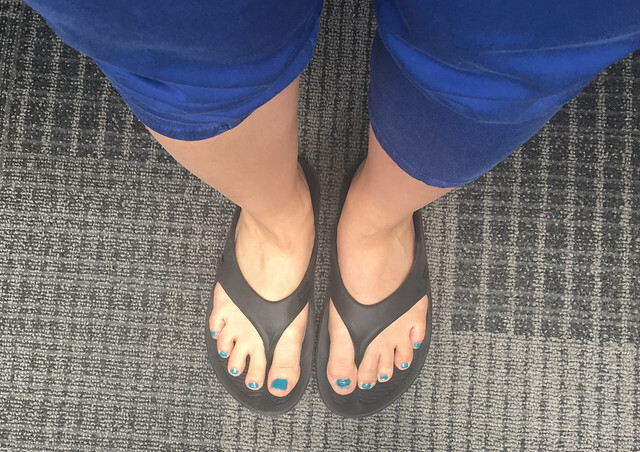 I own two pairs of Oofohs and have been obsessed with them since discovering them in Boston a month ago. I wear them all the time and find that they’ve been really helpful for my sore, tired legs while training for my ultramarathon. JP had told me to look for Lisa at the booth. She was really helpful and fun to chat with. Without hesitation I bought a third pair (the only part I really had to think about was what colour). 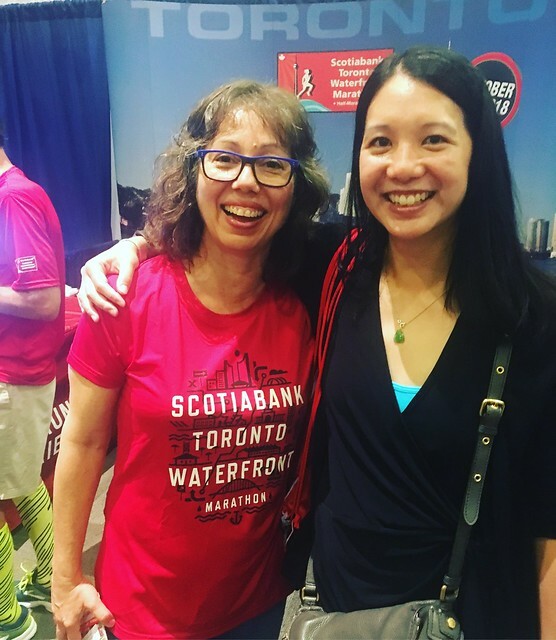 Finally, we stopped by the Canada Running Series booth and chatted with Inge for a bit, while admiring the recently revealed STWM medal (designed by Inge. It’s beautiful!). 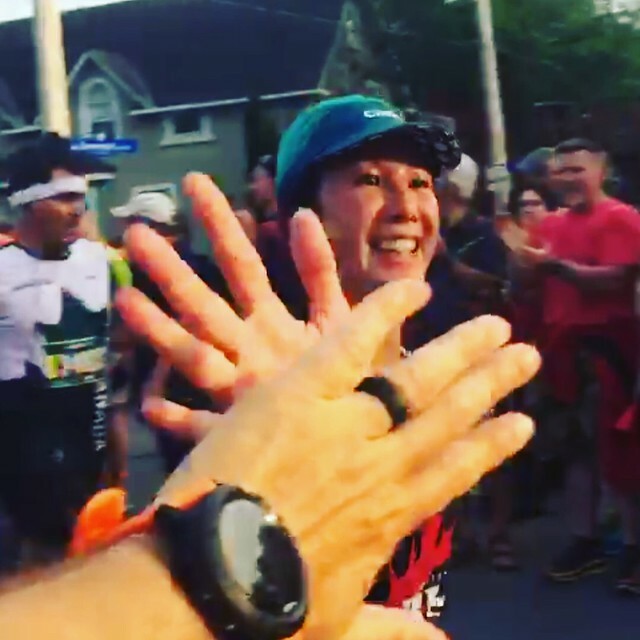 I also meant to drop by the Whole Health Mudcat Marathon booth to say hi to the race director (Sheryl from JP’s Team) but in all my excitement forgot. Dan decided to join JP and Kate for “first supper” (this would be Dan’s first supper and he’d have dinner with us again later). After resting up at the hotel I made my way to the start of the 10k race. 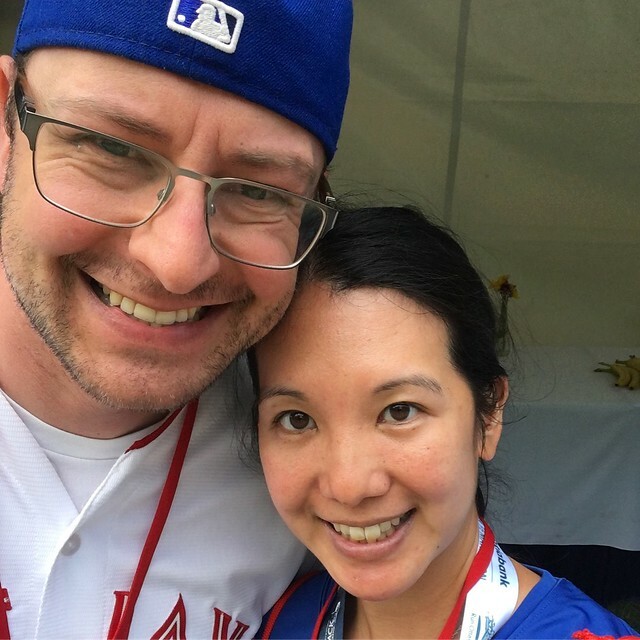 Jennifer was running both the 5k and 10k (with 1.5 hours in between), so I got to see her and Mark before the 10k. 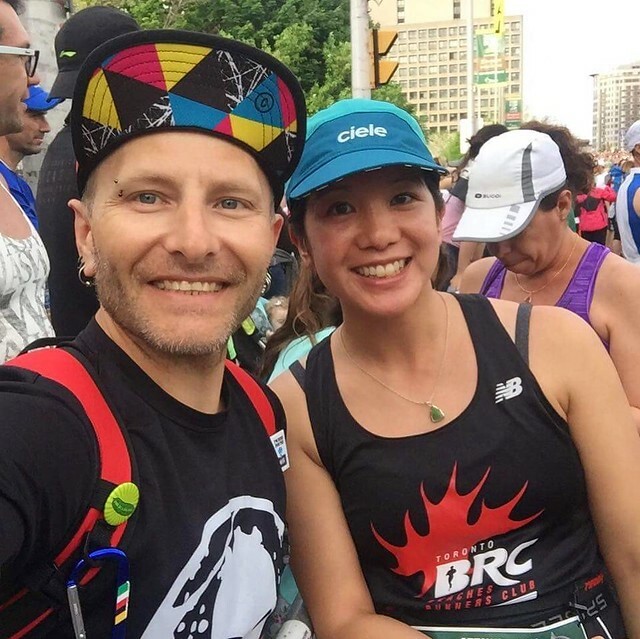 After a lot of text messages back and forth with selfies showing where we were (“I’m at the traffic light” with a picture of one of us at a traffic light lol), I also met up with Cliff, who was running the marathon the next day. It was nice to see him and he cheered for me as I started the race. It was hot and muggy. I ran at a good pace for the first 5k and there was a bit of a breeze by the water, which really helped. 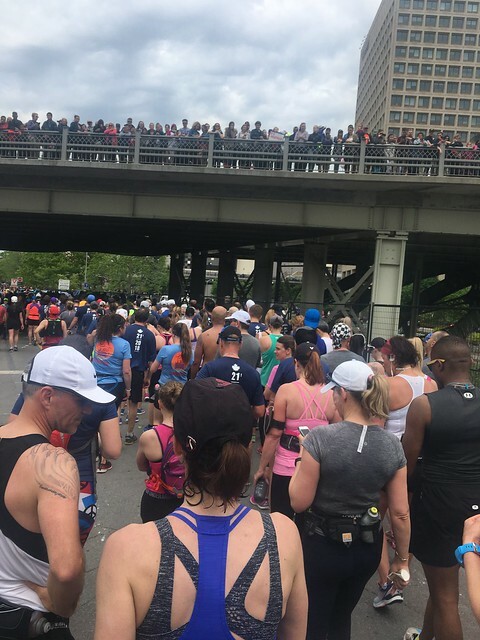 As we ran along the river I could see the elites heading back on the other side. It was really exciting! 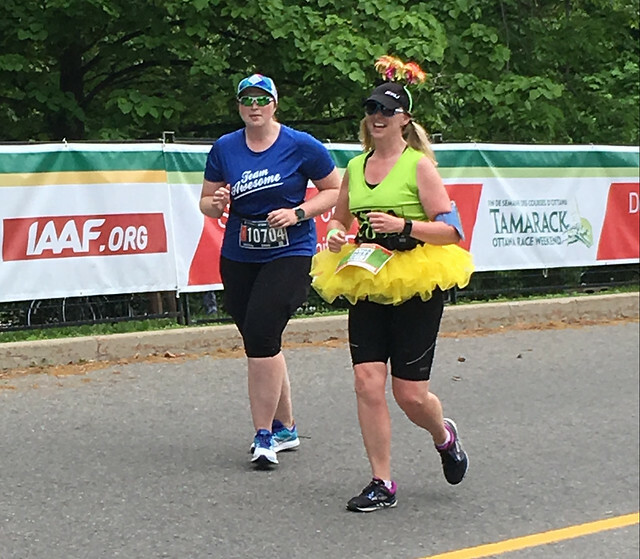 I ran for a bit near a couple dressed with tiger ears and tails and honking a rubber chicken. They were hilarious. After a while I lost them. The second half of the run was hard. I was tired. This was going to be the most kilometres I had ever run in a week (and in a month). The heat was getting to me. I focused on putting one foot in front of the other. I didn’t have any goals for this race except to come in under one hour. 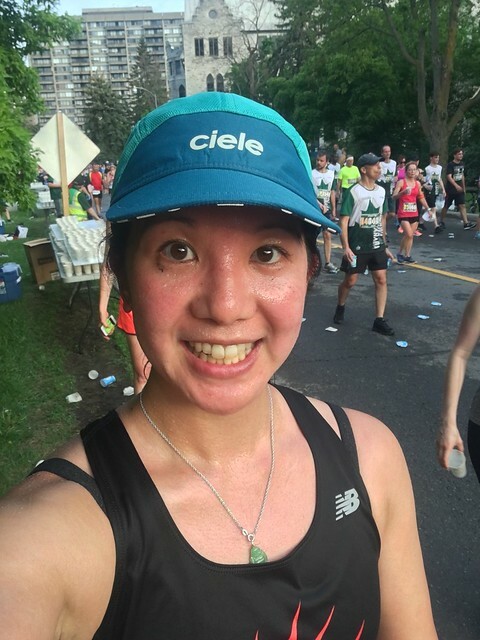 I just wanted to know that I could do it in these conditions since Melly and I will be pacing a friend at the Waterfront 10k in Toronto in June. I saw the OCRC cheer station and started clapping and they started cheering for me. At the end of the cheer station was Rebecca who yelled my name. This gave me the boost I needed to finish the race strong. 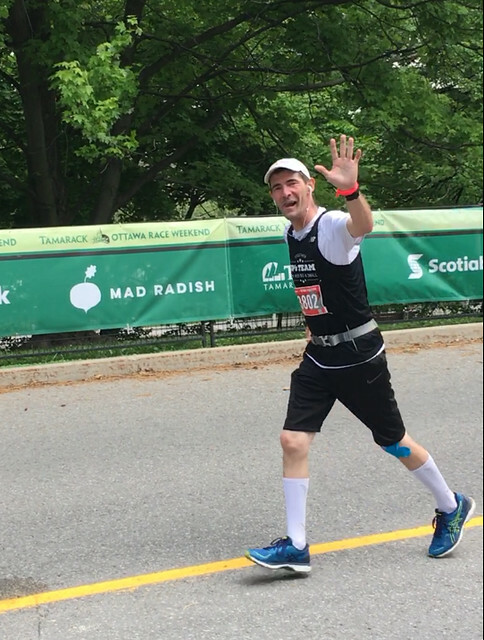 I sped up and high fived Cliff as I approached the finish. I collected my medal and then waited for Jennifer, who had started in a later corral, to finish so we could walk through the chute together. Overall we were both energized by the race (minus the heat). 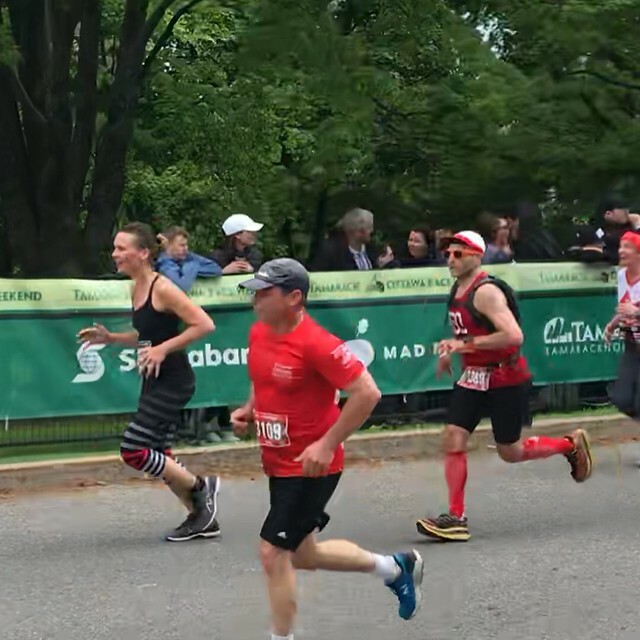 Screenshot from Cliff’s video of me finishing the race. It was hot! I took this selfie to find running mascara mixed with bugs on my face. lol. We went to dinner at Tosca (Dan made reservations there after he had his first dinner there) and Kate dropped by for hugs beforehand. Overall it was a fun night, but the nerves were starting to set in for the half and full marathons the next day. Lucky me, I was able to sleep in again the next day since the half marathon didn’t start until 9 a.m. 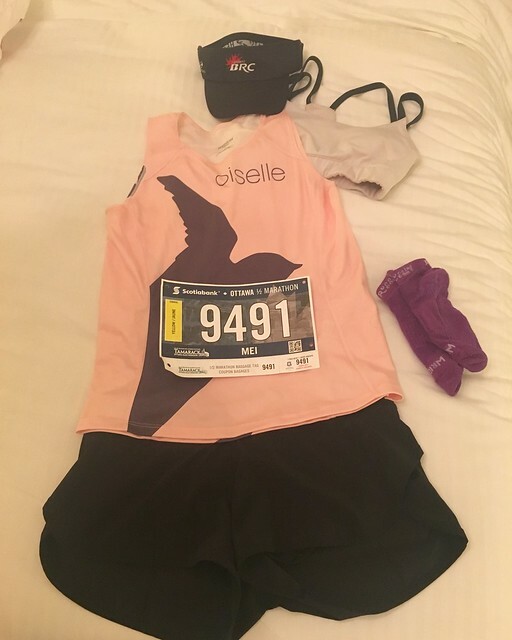 I checked my runner tracker promptly at 7 a.m. (the start time for the full marathon) and cheered for my friends in spirit as they started the full. 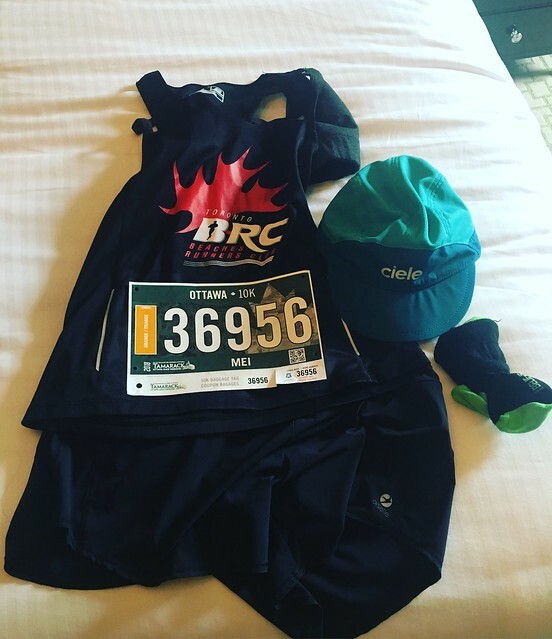 Even though this was my 24th half marathon (and my third half this month) I still felt race day jitters. Dan and I walked to the start together and he wished me luck before heading to his cheering spot by the finish. I saw Rebecca and Annie and we all talked about how good the weather seemed this year. The humidity was gone and it was kind of cool. I was a little cold, which was a good sign. If it could stay like this then the weather would be perfect for running. As my corral was moving forward another runner named Nina chatted with me. She was really nice and it was a good way to help settle our nerves. Then we were off! For the first 5ish kilometres I stayed near the 2:05 pace bunny. First of all, he was wearing the coveted golden ears, and secondly, it felt like a good comfortable pace. As we ran some of the steeper sections I let the race bunny go, but could see him in the distance until around 11 km. Given my training volume, I wasn’t going for a PB. I just wanted to have fun and run a good strong race. 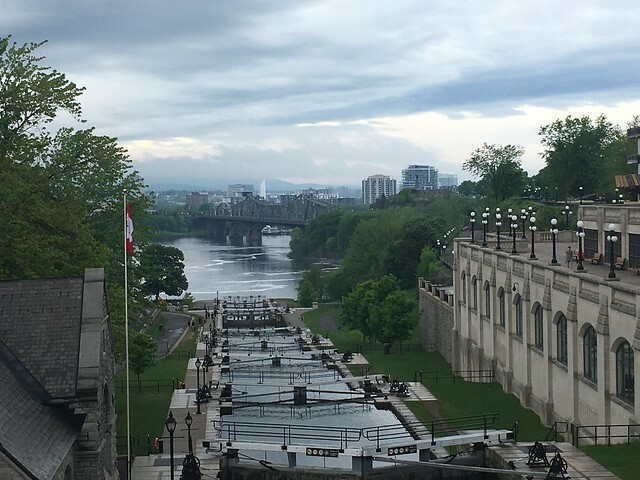 The Ottawa race course was just how I remembered it. Fun, positive, energetic. As I ran I high fived every kid I could. I laughed at all of the signs. I cheered for all of the live music. I darted through the misting stations with my face up and arms outstretched to help cool me down. I had fun. On one of the residential streets there was a woman out hitting a gong repeatedly. I loved her. Everybody was cheering and she was cheering back and you could just feel the energy in the air. The woman at the aid station giving out bananas and oranges made me laugh as she yelled “We have bananas! We have bananas!” I had set up my watch to give me notifications on when my friends running the race had hit each timing mat. Every time it did, I’d look at it and cheer for my friends. It was exciting to know where they all were on the course. 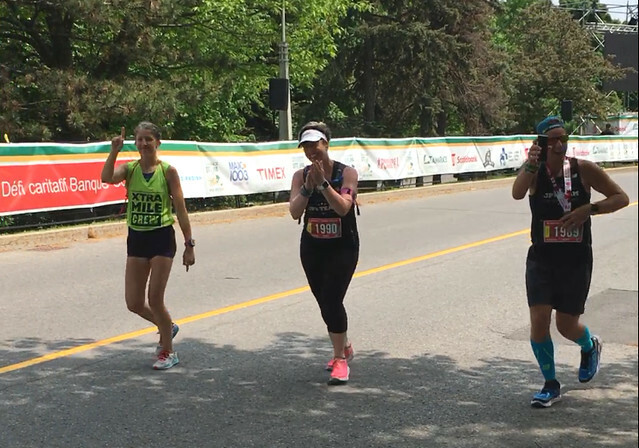 One of the notifications told me that Tracy, who was running her first full marathon, had just crossed the 25k mark. Shortly after that I saw the 25k flag for the marathon and realized she must be close by. I kept my eyes peeled for her and a few minutes later saw her. I ran over to catch up to her and my calves started to cramp. I told them to shut up so I could get to Tracy. It was so good to see her! She looked really strong and was power walking at the time when I saw her (and I mean real power walking. Not the marathon shuffle walking that I’ve been known to do). She was so positive and moving so well. I was really proud of her. We took a quick selfie (I yelled “Keep moving!” after I took it because I didn’t want her to lose momentum). Seeing her gave me such a boost. I wished her luck on the rest of her race and told her how great she was doing. And then I continued running. As I reached the bridge I heard a woman yelling “We’re having fun! 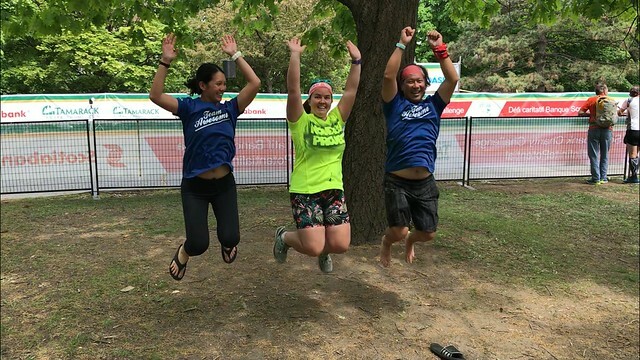 This is fun!” (this was something Dan had yelled during Around the Bay this year when he ran it with Nicole and Melly). There was a kid next to the woman who yelled “No we’re not! This is not fun!” I burst out laughing hearing them. After this it was the homestretch and I started ticking off the kilometres left to run. 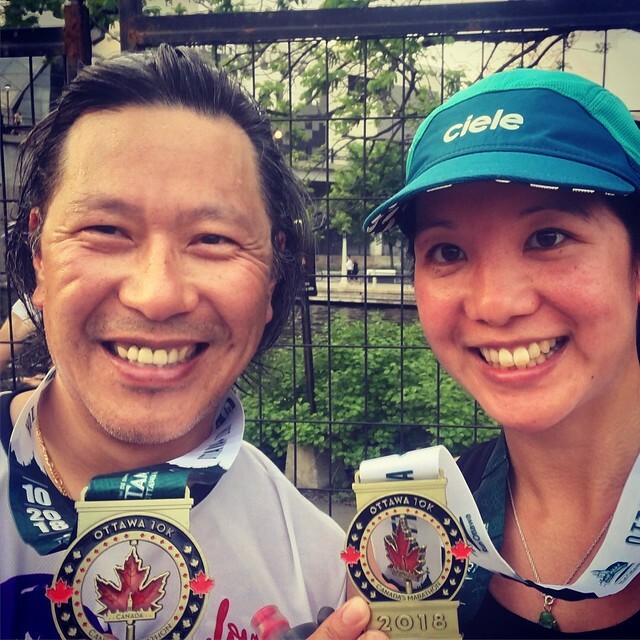 As I approached the 19k mark, my watch signaled to me that Kate and Cliff had both crossed the finish line for the half marathon. I knew I wasn’t that far behind them then. JP finishing the marathon (I was about 11kms into the half). I was going to keep running but they were handing out freezies on the course. It was hot at this point and I honestly can’t refuse a good freezie. As luck would have it, they handed me a blue freezie too (the one I was craving) so I took it and stopped and walked so I could eat it. It was delicious and well worth it. 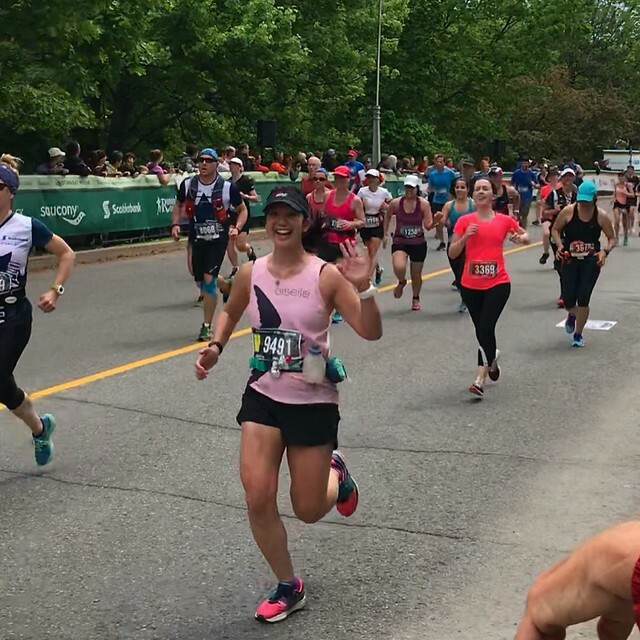 I saw the OCRC cheer station and ran through it where they were screaming at me and the person with the megaphone said “Best smile on the course!” I couldn’t stop smiling. After they were out of sight I stopped to walk and finish my freezie before heading down the last few kilometres. I stayed to the left on the homestretch and saw Dan shortly before the finish line. I was so happy to see him and it helped me run strong to the end. At the finish I couldn’t stop beaming. There was a line up to get our half marathon medals, but it cleared quickly. I grabbed my food, left the finishing area and met up with Dan. 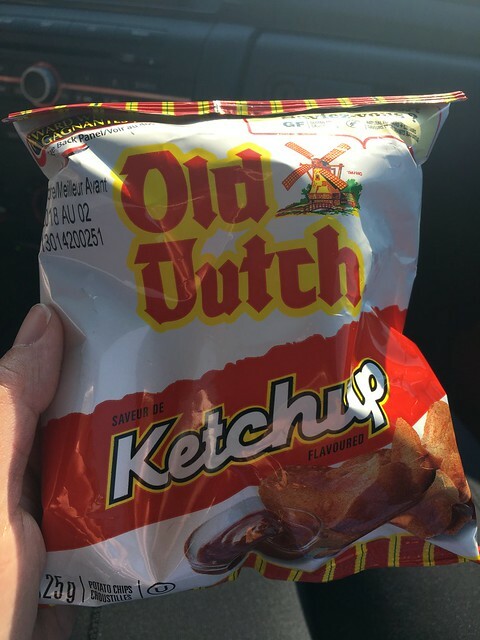 I love ketcup chips, so I was thrilled to get a bag of these at both races! 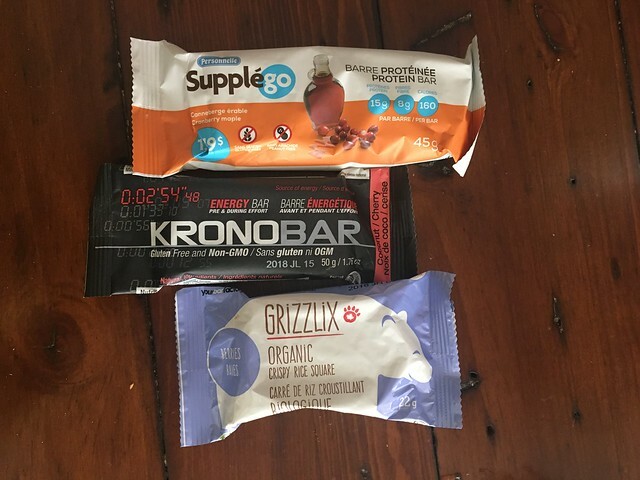 Some of the delicious post-race snacks. I also had a banana. We stopped by city hall where I changed in a bathroom. While I was there, I got notifications that Rebecca and Jarek had both finished their races. I had been hoping to cheer them in, but they were too fast! I texted Rebecca congratulations. I felt really proud of her given she was sick recently (and was antibiotics). She did great! Dan and I went back to the finish area to cheer for more runners. We ran into Lara on our way and also Dan from Team Awesome and his daughter (also named Mei Ling). So there were two Dans and two Mei Lings eating delicious food from one of TORW’s sponsors, Mad Radish. We cheered for some runners together before I joined Rebecca to cheer for Tracy (accompanied by Scott, who was running her in after running his marathon) as she ran to the finish. Overall it was an awesome day. I can’t stop smiling whenever I think about it and all of my friends have been talking about how much they want to do it again. Fellow Team Awesome members: Tanya running Emma in. 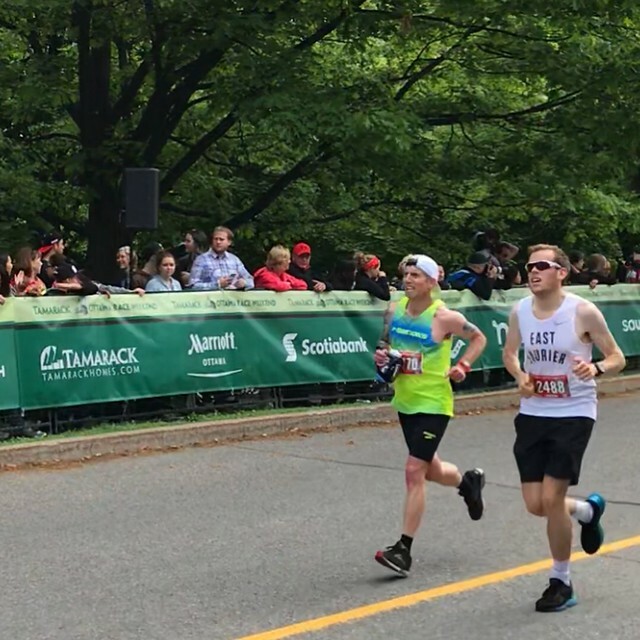 Mike looked great at the end of his marathon! Tracy and Scott finishing strong. 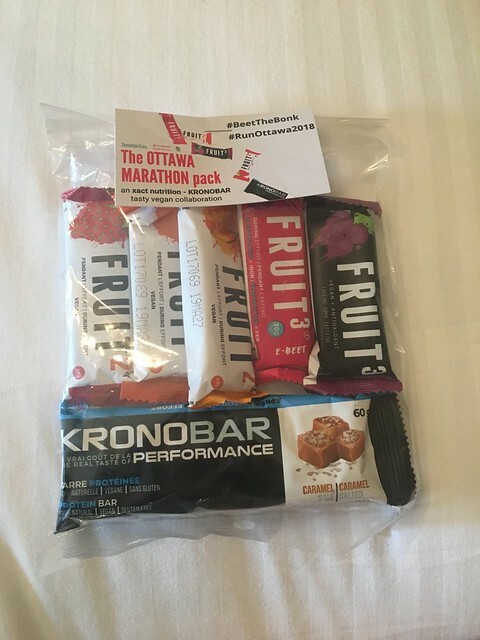 Ottawa has a truly incredible running community and you can see why this is a first class race weekend. 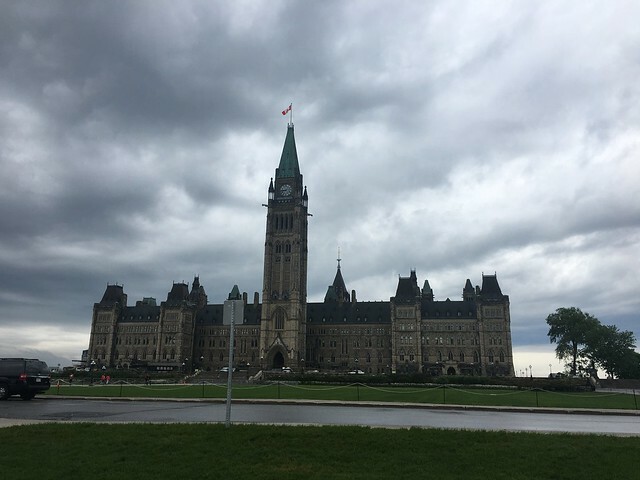 Thank you Ottawa. We’ll see you again next year!